North Korea flight-tested its Pukkuksong medium-range ballistic missile for the second time this year. 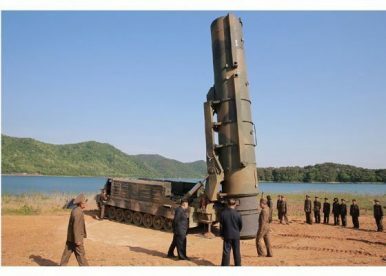 On Sunday afternoon, North Korea launched a Pukkuksong-2 solid fuel, medium-range ballistic missile (MRBM) from Pukchang county in South Pyongan province. The missile landed in the Sea of Japan, flying to a range of 500 kilometers and exhibiting an apogee of 560 kilometers. The launch marks the second North Korean ballistic missile test since South Korean President Moon Jae-in was inaugurated. Before North Korean state media confirmed that the missile tested was indeed the Pukkuksong-2 MRBM, several North Korea-watchers had anticipated that the test involved a Pukkuksong-2 given the nearly identical range and apogee to the first-ever test flight of the system back in February (I also discussed the significance of the missile on the podcast here at the Diplomat). Sunday’s test marks the 11th North Korean ballistic missile launch this year and marks the second in just a week — North Korea test-fired the Hwasong-12 intermediate-range ballistic missile last Sunday. The launch marks the 8th overall flight test of the Pukkuksong family of missiles (the program began with the Pukkuksong-1 submarine-launched ballistic missile). Images released by North Korea’s Rodong Sinmun offer additional insight into how North Korea may look to use the Pukkuksong-2, which is unique in that it is North Korea’s first land-based, solid-fuel MRBM with a tracked transporter-erector-launcher (TEL), that allows for off-road (and, critically, off-paved-road) use. 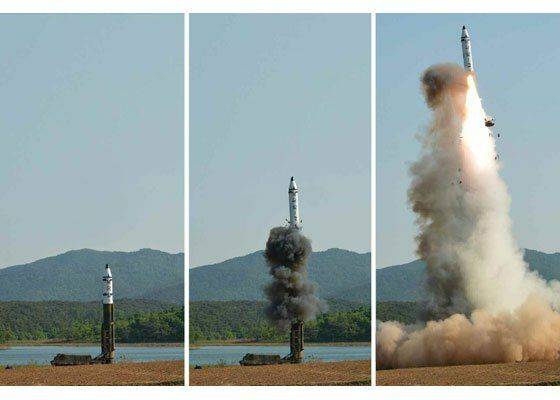 Accordingly, the images show the Pukkuksong-2’s TEL erecting and launching from an unremarkable patch of dirt next to a body of water (likely Yonpung-ho Lake). This is a departure from the February test, where the TEL launched the missile off paved ground near Kusong. As I explained in February, the Pukkuksong-2 is a significant development for North Korea because it would allow it disperse ready-to-fire solid-fuel missiles on launchers that can fire from nearly anywhere all over the country. As a result, Pyongyang’s nuclear forces would enjoy greater survivability against the United States and South Korea, who may have otherwise been more tempted to undertake a preemptive attack. From the images released so far, the ejection and launch of the missile itself look quite similar to the February launch. The Pukkuksong-2 TEL still “cold launches” the missile (ejects it out of the canister using pressurized gas, with the missile’s engines igniting in the air). Interestingly, the images show a considerably dirtier (smokier) ejection when compared with imagery from February, which could be a result of natural variance between the two missiles or even the TELs. Finally, what’s striking about the imagery released by Rodong Sinmun is a series that shows what is presumably a near-real-time image of the earth taken by the Pukkuksong-2’s reentry vehicle. 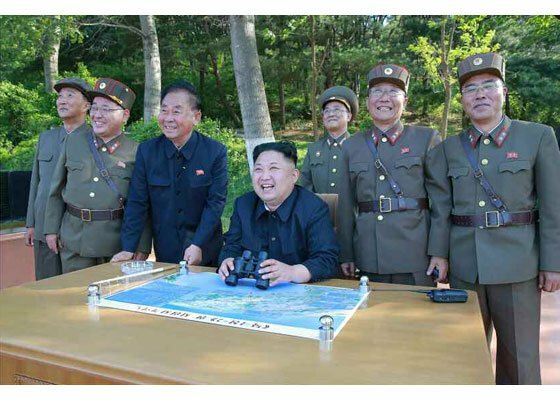 In one image, Kim Jong-un is seen pointing at a monitor displaying an image of the earth too. The authenticity of the images isn’t clear, but North Korea clearly wants outside observers to be impressed with these capabilities. There’ll no doubt be more to say about this missile as analysis continues. The bottom line from Sunday’s test seems to be that North Korea is growing increasingly confident in its solid-fuel missile program and may look to take the experience its engineers have gained through the Pukkuksong series of missiles to more advanced, longer-range systems — perhaps one day, even an intercontinental-range system. From the perspective of Pyongyang’s nuclear strategy and thinking about deterrence, Kim Jong-un declaring the Pukkuksong-2 deployment-ready is a significant moment. North Korea’s self-stated nuclear strategy hinges around its ability to hold in-theater U.S., South Korea, and Japanese military targets under threat. The Pukkuksong-2 MRBM appears tailor-made to do just that. North Korean scientists tested a new solid fuel engine on October 2017. What system is it destined for?